84 Arab Christians joined the IDF in the last half of 2013 and the numbers are expected to rise. The past six months have seen a significant rise in the number of Arab Christians joining the Israel Defense Forces, according to a report Sunday in Haaretz. The report said that last Tuesday evening, Father Gabriel Nadaf, a Greek-Orthodox priest active in a group founded in 2012 and which supports and works toward more Christian Israelis joining the army, held a meeting at the home of a local family in the Galilee town of Shfaram. Shortly after last week’s meeting started, a number of young men came to the door and demanded that Nadaf and everyone with him leave. The host, who wanted to avoid violent confrontation, decided to end the meeting. But the leaders of the fight against Nadaf’s initiative have promised to protest everywhere that the forum comes to preach its message about joining the army, according to Haaretz. Nadaf has advocated for a strong connection among Arab Christians with the State of Israel and has been sanctioned by the official Greek Orthodox church over his views. Arab MKs have also condemned him, calling him “an agent of Zionism who seeks to divide Arabs.”. Nadaf’s 17-year-old son was violently attacked in Nazareth in December. The attacker was identified as an activist from the extreme-left Hadash party. The IDF does not provide precise numbers of Christians serving in its ranks, but the forum says the rise is significant and that there are currently 300 Christians serving in the IDF, 157 of them in the conscript army. According to figures presented at a meeting sponsored by the Defense Ministry late last year in Upper Nazareth, 84 Christians joined in the last half of 2013. In the past, that was the number that joined over 18 months. The forum says there are dozens more waiting in the wings. Maj. Elias Karam, of Ilabun in the Lower Galilee, served on an Israel Navy gunship and is now stationed at the Haifa naval base. Speaking to Haaretz, Karam said his three brothers also joined the IDF or the Border Police. 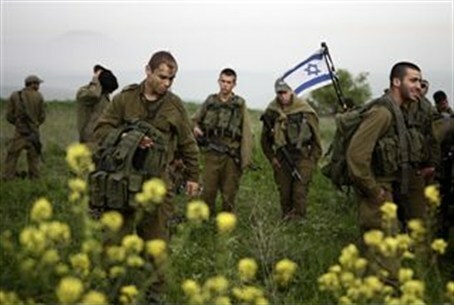 Supporters of the initiative told Haaretz that the impetus for the rising numbers of recruits might be coming from outside Israel – attacks on churches in Egypt and the beheading of priests in Syria have strengthened the view that the Arab world cannot be relied on, and therefore integration into Israel is the best protection for them. The report comes at a time when the issue of enlistment for all Israelis, including hareidim and Arabs, is making headlines in Israel. While the focus has been mostly on the enlistment of hareidim, Arab enlistment is also an issue. Arab MKs, such as Hanin Zoabi, are strongly opposed to enlistment of Arabs, Christian or Muslims. Zoabi has in the past told Arutz Sheva that Israel should “prepare the prisons” if a law requiring Arab Israelis to enlist in the army is passed. Several months ago, two Arab Christian female Israelis who enlisted in the army told Channel 10 News that Zoabi does not represent them nor, in fact, does she represent many other Israeli Arabs who want to serve in the army. One of the two said that "people like Zoabi should go to Gaza, where they will be welcomed with open arms."